Well, just as I’ve gotten the hang of high altitude baking, it’s time for me to move to Edmonton – which sits much closer to sea level. Before I depart, however, I would like to share a little of my hard-won knowledge. (Some of you might recall my initial attempts that resulted in ‘flat tire cookies’). As anyone who knows me well will tell you, I’m a pancake fiend. When I lived in England and couldn’t find the Aunt Jemima mix I had grown up with, I figured out how to make them from scratch (and tried to convert my British friends to maple syrup with mixed results). 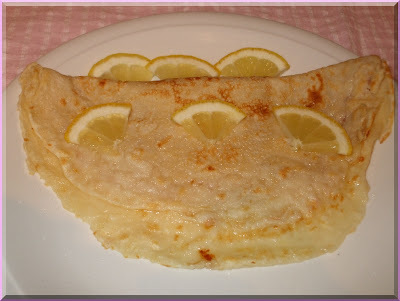 The Brits I lived with ate pancakes on Shrove Tuesday like this: flat, crepe-like pancakes served with sugar and lemon juice. Sorry, mates, just not the same! My next pancake challenge in life came when I moved here to Wyoming. It turns out that like cookies, they react to the higher altitude and my first efforts were more like crepes than the fluffy North American-style deliciousness I crave. Don’t get me wrong, I like crepes too, but they’re just different. Extras: 1 cup fresh or frozen blueberries, chocolate chips, or slice bananas on to the batter-side of the pancake once it’s in the pan. In a large mixing bowl, combine all the dry ingredients. Don’t try and skimp on the salt (as I tried a few times) – for whatever reason it affects the fluffiness factor. To cut down on dishes, I measure the milk into a 2-cup measuring cup, then add the eggs and oil to it, mixing it until the yolks are broken up. Pour the wet ingredients into the bowl with the dry ingredients and ladle it up with love onto a hot, non-stick pan or griddle. Instead of 1 1/2 cups of white flour, I usually do 1/2 cup white, 1 cup minus 1 tbsp whole wheat flour, and 1 tbsp of ground flaxseed. I also use skim milk instead of 1% or 2%. They turn out really nice! My favourite these days is to defrost mixed berries (it isn’t exactly berry season in Wyoming) and spoon them over my pancakes. And of course you need maple syrup – and none of this ‘table syrup crap’ – it has to be the real stuff from Canada or, if you’re really in a pinch, Vermont. And crispy bacon on the side, of course. Add a hot cup of coffee and a glass of cold OJ and you will soon be in breakfast heaven, my friend.